Basic single-panel cubed sphere Coordinates. 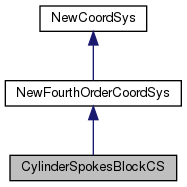 The CylinderSpokesBlockCS class implements the NewFourthOrderCoordSys class for cylindrical panels in equiangular coordinates. a_blockNum: block number a_dx: cell spacing a_baseCell: index of bottom-left corner of this block in mapped space.